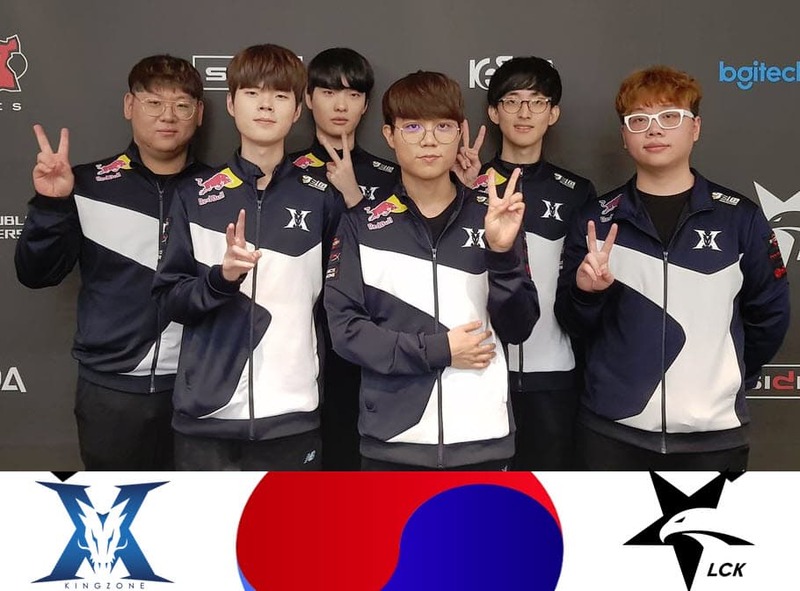 Day 3 of the 2019 LCK spring split’s third week saw a surprising win for Kingzone DragonX against DAMWON Gaming. The early season favorites now find themselves coming with three consecutive losses after winning the first two series of the split. KZ, on the other hand, has left its 0-2 start behind and now rides a streak of three consecutive series wins. Jin Air Green Wings continues its fast descent to the Challenger Series. With only one game win in five series, JAG’s record dropped to 0-5 after suffering yet another sweep, this time at the hands of Hanwha Life Esports. Jang “Nuguri” Ha-gwon (Viktor) picked up the first kill following a messy Kingzone gank. Moon “Cuzz” Woo-chan (Jax) and Kim “Rascal” Kwang-hee (Akali) chased the DAMWON Gaming top laner under the turret, but Rascal took a hit from the tower and gifted the first blood to the DWG player. A second unsuccessful gank gave the lane away as DAMWON secured the first turret. The teams mirrored the map as KZ shifted its focus to the bottom side, securing three elemental buffs and pushing the lane all the way up to DWG’s tier 2 turret. At the 30 minute mark, DAMWON found a good fight as the teams battled to control the Baron pit. Nuguri split pushed in the bottom lane as the LCK newcomers seemingly had the game in their hands. KZ contested the call and forced the objective to reset, although in the end DWG were the ones to start it once again. Support Park “TusiN” Jong-ik (Rakan) joined in and stole the Baron with a Smite from his Unsealed Spellbook. Kingzone didn’t get to use the buff though as DAMWON aced their opponents. Still, TusiN stopped DWG from potentially winning the game with a Baron powerplay. The turning point came as KZ picked off Heo “ShowMaker” Su (Lissandra) in the bottom lane. DAMWON tried to respond but did so in a bad way. The remaining four players showed up one at a time and instantly went down as Kingzone scored an easy ace. 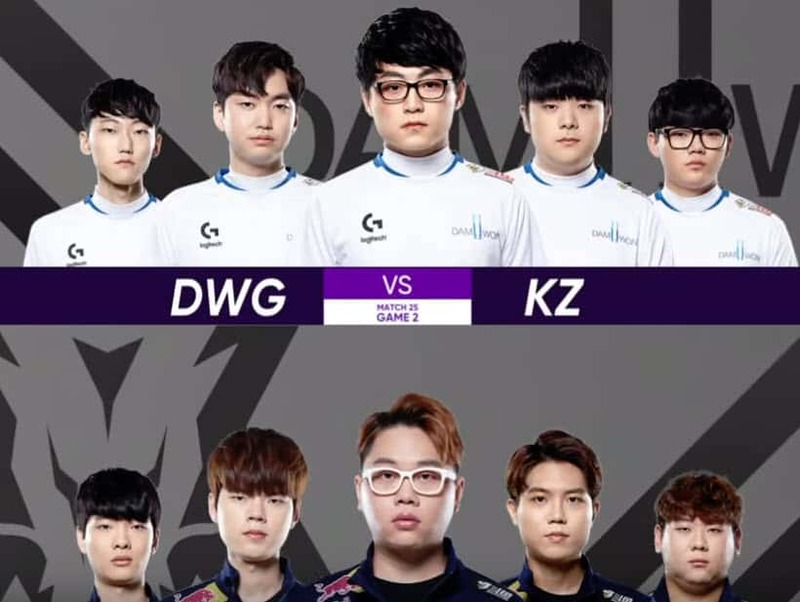 KZ continued to pickoff DWG’s players and turned one of those plays into an Elder dragon powered by four elemental buffs. The 2018 LCK spring champions followed that with a Baron buff. Heo “PawN” Won-seok (Sion) stayed behind to buy time, although it also gave DWG an important one man advantage. DAMWON continued to push in, and even with Kingzone holding the two major buffs, destroyed a mid lane inhibitor while pushing for the Nexus. The team did take down one of Nexus turrets, but had to fall back. Back to full strength, KZ went for a mid lane push. In the end, the two buffs were too much for DAMWON to handle as Kingzone forced its way inside the base and destroyed the Nexus after 43 minutes of play. Kingzone used its top side priority to take the Rift Herald and forced Nuguri (Jarvan IV) out of the lane. The team then proceeded to take the first turret along with five plates and the additional gold. The first kill however went DAMWON’s way as Kim “Canyon” Geon-bu (Zac) picked TusiN (Braum) with the Ultimate and secured the kill. As the teams tried to control the area around the Baron pit, Nuguri was picked off. Kingzone set up an ambush and as the other four DWG players showed up. Sin “Nuclear” Jeong-hyeon was the only one to escape as KZ easily secured the Baron buff. The powerplay opened two inhibitors on DAMWON’s side. Following a successful fight inside DWG’s jungler, Kingzone went for the Nexus. With super minions coming from two sides of the map, DAMWON had no way to defend itself as Kingzone completed the sweep. Things got off to a great start for JAG as the team committed three players to a bottom lane dive and AD carry Moon “Route” Geom-su (Kai’Sa) picked up a double kill to open the score. Jin Air also added an Infernald drake and the first turret, with all five plates included in the package. It looked like Jin Air was set for the win as the last placed team also destroyed HLE’s outer turrets and had complete control over the map. JAG went for the Baron at the 30 minute mark and Hanwha Life showed up to contest the call. It all went downhill for Jin Air as Route got overly aggressive and got himself in a bad spot. 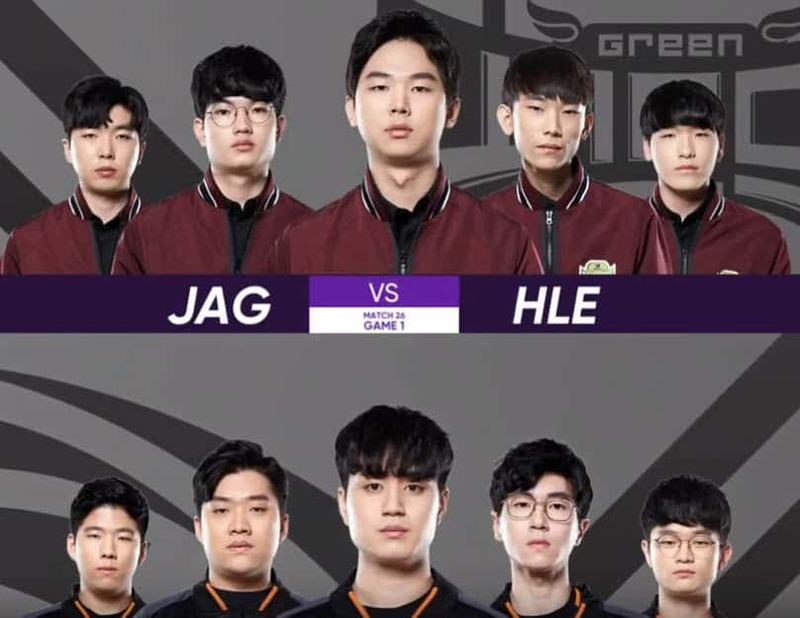 HLE used the opportunity to take down JAG’s primary damage source and followed that with three more kills, setting up a Baron for themselves. Kim “Malrang” Geun-seong (Kha’Zix) did not attempt the steal and Hanwha secured an uncontested objective. Jin Air went for a teamfight in the mid lane to stop Hanwha’s push. It started well for JAG, but Route once again got overly aggressive and got caught out of position while trying to clean up the skirmish. With Malrang being the only one left on Jin Air’s side, HLE went for the Nexus. 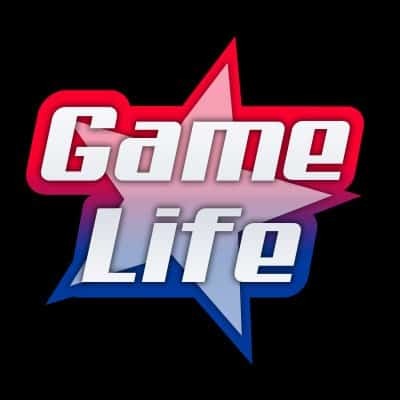 Route spawned too late to try anything and Hanwha Life opened the series’ score. HLE showed its composition’s pickoff potential on Lee “Grace” Chan-ju (Urgot), taking down the Jin Air mid laner for the first blood. Another pick inside JAG’s side of the jungle led to Hanwha Life securing the first turret. JAG looked completely lost as Hanwha Life continued to pick them apart. The Baron went Hanwha’s way at the 28 minute mark, following an earlier ace by the team. Up by more than 10,000 gold, HLE used the powerplay to push into JAG’s base through the bottom lane. With a clean ace, HLE went for the Nexus in order to complete the sweep.